Hagrid is one of the most cherished characters of the Harry Potter series. 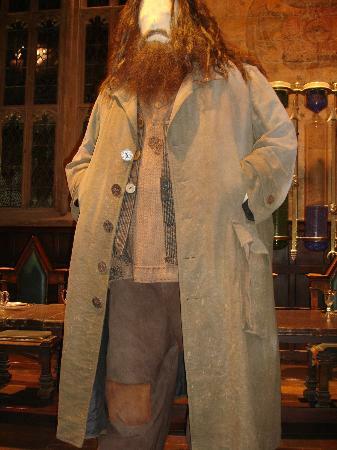 If you are interested in looking and dressing like Hagrid, you will need to be to fairly huge physically. The rest should be simple and the items you would need for a Hagrid costume are inexpensive. However, getting the combination spot on would take some practice and patience. Keep in mind that for a nearly perfect Hagrid costume, it would be best to use items that look a little rusty and old. New costume items will not have the desired affect. Imitate Hagrid’s bushy black beard and long wild hair. These may take a fairly long time to grow. Keep your hair as wild and unkempt as possible. You might want to buy a wig and beard at a costume shop if you do not have time to grow a natural beard and hair. Invest in groundskeepers cloths. Add stuffing to the clothes for a more natural Hagrid look. Any Harry Potter fan would know that Hagrid is nothing short of a half giant. You would want to look as huge in your clothes as possible. Get a large moleskin jacket with multiple pockets. Hagrid’s coat was shown to contain many different things such as a teapot and several chipped mugs. In the Sorcerer’s Stone, Hagrid took out a birthday cake for Harry as a birthday present. Hagrid was seen performing magic with a sixteen inch oak embedded in pink umbrella in the first part of the Harry Potter series - the Sorcerer’s Stone. The umbrella served as a camouflage for the wand. Get a large pink umbrella and carry it inside the moleskin jacket. Hagrid was seen carrying a dangerous magical creature with him most of the times, for instance the boar hound named fang. Apart from the hound, acromantula, a hippogriff, a dragon and a hellhound were some of the magical creatures accompanying Hagrid in different parts of the Harry Potter series. Get replicas of one or more of these magical creatures at a toy or costume store or go online and perform a search.